As an entrepreneur approaching the end of the year, you may be thinking about how you’ll be ringing in the new year, but more importantly, what is in store for your business in 2019? Before beginning, give yourself a well-deserved pat on the back for all your accomplishments over the past year. If you’ve recently started your business, it’s time to write that business plan if you haven’t already done so. Have you recently changed your brand’s voice or your core values? Write that strategic plan. If you’ve been in the game for a while, it’s time to evaluate what has worked, what didn’t, and make plans to grow your revenue and your influence in the market. 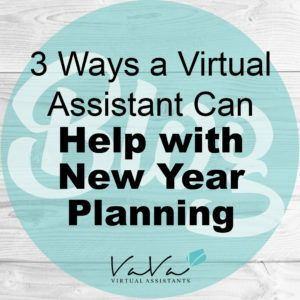 Either way, end-of-the-year business planning is a great time to use the skills of a Virtual Assistant (VA). VA’s can play an essential part in planning the future of your business by helping you review, strategize and plan. They can also take other tasks off your to-do list as you focus on bigger picture business needs. As you sit down to think about what you need to do next, you may find that you’re going to need help. This is a great time to do a SWOT analysis, which includes a review of your business strengths, weaknesses, opportunities and threats. If your business has considerably changed, and your brand has moved in a different direction, it’s time to revisit it. A VA can help you simplify and focus your message or redesign your logo. Whatever it may be, understand that things change throughout the year and this means your business plan, and even your brand, needs to adjust with it. Reviewing your marketing strategy is an important step to ensuring your business is running successfully. We can become satisfied with the way things are instead of looking at what could bring us a larger profit margin. A marketing VA can help you to review your existing marketing strategy and goals, then make suggestions as to how you can improve in 2019. They can also help you to maintain or build your marketing momentum for the new year by writing blog posts, updating your website, or managing your social media on an ongoing basis. As a business owner, the key to juggling multiple projects and wearing many hats, is getting organized and delegating. Decluttering your desk, organizing your email inbox or managing your calendar will allow you to go into the new year with a fresh start. Allow a VA to help you manage your calendar and organize your inbox to ensure that you never miss a meeting or an important deadline. The new year is a fresh opportunity to take a step back and take a look at what you have accomplished, how far you’ve come and where you want to go next. As a busy entrepreneur planning for 2019, you may be bogged down by an endless to-do list. At VaVa, our assistants can help you focus on your business planning and give you an extra hand. Book a discovery call with us today to find out if a VA is right for you!